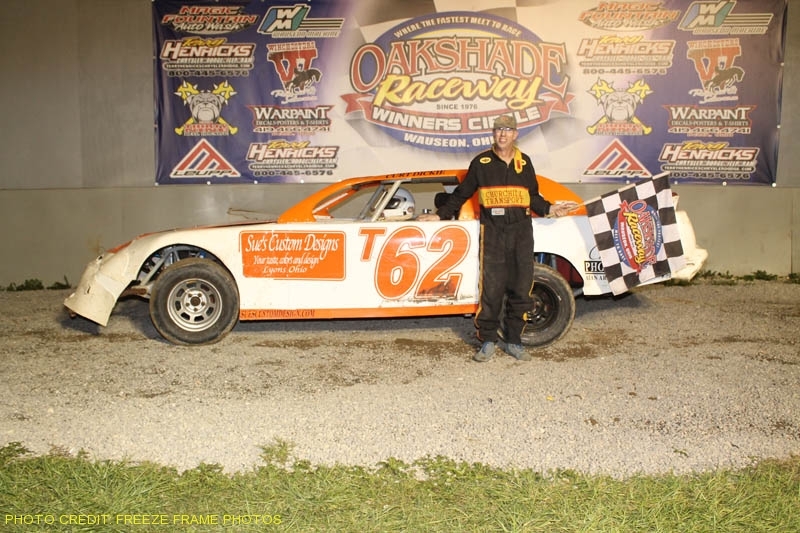 2006 Oakshade Raceway UMP Late Model and UMP Sportsman Champion Rusty Schlenk continued his dominance from a season ago by picking up the wins in both the UMP Late Model and UMP Sportsman feature events on Oakshade Raceway’s opening night. The competition was fierce as usual at Oakshade as a total of 43 UMP Late Models vied to get into the 20-car field UMP Late Model Feature. Brian Ruhlman in the Zeller’s Towing number one started on the pole alongside Chris Ross, who has new equipment this year, in the 25-lap feature. Ruhlman jumped out to the lead at the start and was pursued by Dusty Moore, who started on the outside of row two, and Rusty Schlenk. Schlenk took over second from Moore shortly before Kevin Reeve spun on lap seven to bring out the first yellow flag of the race. Ruhlman and Schlenk broke away from the rest of the pack after the restart. Another caution after Ky Harper and Ron Miller spun on lap 13 tightened up the field behind Ruhlman. Schlenk dove to the inside of Ruhlman a lap after the restart and battled side by side for the lead for a couple laps. Ruhlman fended off the challenge and retained the lead. Schlenk then decided to look to the outside of Ruhlman and got alongside once again just as the third caution flag flew. Once they were back under green flag racing, Schlenk darted to the outside of Ruhlman and with three laps to go, took the lead away from Ruhlman for good. Jackson, Michigan’s Rusty Schlenk pulled away in the closing laps and went on to pick up the feature win over Brian Ruhlman and Dusty Moore. Ronnie Perrine started 13th and worked his way up to finish fourth ahead of Rick Delong. The Schlenk Show continued into the UMP Sportsman Feature after he quickly jumped into the Racer’s Connection 28z to start on the outside of row four. Tim Line took advantage of starting on the outside of the front row to take the point position early in the race with Tim and Brian Fisher in tow. Tim Fisher made it three wide to take the lead as Schlenk closed in on the leaders. Schlenk looked to have the lead, but a caution on lap three saved Fisher giving him the lead back for the restart. Schlenk jumped to the outside immediately after the restart to get by Fisher for the lead and then proceeded to open up a big advantage. Meanwhile, Josh Steinacker was on the move passing a lot of cars on the outside and took over second by lap seven. Bruce Stuart’s spin on lap eight brought out another caution period allowing Steinacker to close right up to the rear bumper of Schlenk for the restart. Both Schlenk and Steinacker pulled away from the rest of the competitors battling with each other for the lead. Steinacker appeared to have the faster car, but could not get by the 28z of Schlenk. Steinacker lost a lot of ground late in the race after getting a little bit too high into the loose stuff on top of turns one and two. Steinacker held on and quickly reeled the leader back in. Another late caution set up a two lap dash to the finish, but Steinacker’s car seemed to take a few green flag laps to get up to full speed which allowed Schlenk to hold on to pick up his second feature win of the night. Adrian, Michigan’s Brian Fisher finished third behind Steinacker with second year UMP Sportsman driver Bob Gregory taking fourth. Mike Jessen was fifth. Craig Dippman had a strong 2006 racing season in the Bomber division at Oakshade and looked to be on his way to another Bomber A Feature win. Defending Bomber Champion Tom Ordway had other ideas moving up to second by lap four after starting ninth. Brian Przepiora closed in behind Ordway into third. Ordway could get to the inside of Dippman in the corners to challenge for the lead, but could not make it stick to take over the top spot with Przepiora running just behind the leaders. Ordway kept working at it and took the lead as the white flag waved and went on to take the checkered. Dippman tried to battle back and lost second position to Przepiora. Brett Miller and B.J. Gregory rounded out the rest of the top five finishers. Wade Rick and Jeff Foks Jr. put on a pretty good battle at the front of the Bomber B Main with Foks eventually passing on the inside to take the lead. He held the lead until Dan Dippman closed in and got to the inside on the final lap. The two drivers battled side by side down the backstretch and closed in on a slower lapped car as they entered turn three. Foks and Dippman made what looked to be incidental contact as the racing got very tight and Foks went spinning. Dippman went on to win followed by Wade Rick, Mark Pollack, Brad Brehm and Bob Rendel. Jeff Foks Jr. fell back to finish ninth. Roger Davenport moved up to take the lead by the end of lap one of the Bomber C Main after being scheduled to start on the outside of the the fourth row. Brent Hartsworm and Jim Plotts, who started deep in the field, ran second and third with Josh Montague closing in until Davenport disappeared from competition retiring to the pits. That turned the lead over to Hartsworm which turned out to be short lived. Montague got by Plotts and then both Montague and Plotts passed Hartsworm for the top two positions. Plotts tried to get to the inside of Montague for the lead, but Josh Montague from West Unity, Ohio was too strong and picked up the victory. Hartsworm held on to finish third ahead of Dennis Briegel and Larry Smith. The great racing action continues May 12 at Oakshade Raceway with UMP Late Models, UMP Sportsmen and Bombers back in action. Gates open at 4pm with racing starting at 7pm. Check out www.oakshaderaceway.info for more information.